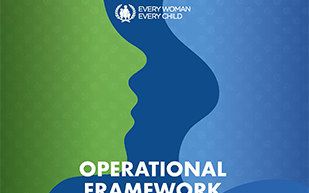 The Operational Framework is a resource for governments and the wide diversity of stakeholders within countries whose contributions are vital to improving the health and wellbeing of women, children and adolescents. It offers guidance and options for how to translate the Global Strategy into sub-national strategies and plans, building on existing country processes. The Strategy and Coordination Group for the Global Strategy requested the Government of India, Partners in Population and Development and UNICEF to co-chair the process of developing the Operational Framework. The co-chairs were supported by a writing group drawn from Every Woman Every Child partners from governments, civil society, the private sector and development partners, and this first iteration of the Operational Framework was informed by a number of public consultations. The Operational Framework will be a “living document”, continually updated along the lifespan of the Global Strategy. Download the Global Strategy Operational Framework.